Lake Wylie is getting a brand new Dunkin’ Donuts this summer, just in time for iced coffee season. The coffee chain will be opening at the Collett development site, just off of S.C. 49 and Carroll Cove Lane. The store opening has been in the works for a while and is looking forward to quickly becoming a part of the fabric of the Lake Wylie community. The building will be approximately 2,000 square feet and will include the always important drive-up window. Free WiFi, digital menu boards and as many as 50 parking spaces will not only make this location super convenient, but it will also be the most up-to-date design that Dunkin’ Donuts offers and will be loaded with technology. The Lake Wylie store is slated to open by the end of June and is currently a bit ahead of schedule. The shop will hire about 30 employees, both full- and part-time, with operating hours between 5 a.m. and 10 p.m. daily. It is conveniently located at the intersection near the new Publix and Walmart with lots of natural traffic already passing through the area. And while Dunkin’ Donuts is known for its coffee, it also offers plenty of healthy breakfast and lunch options, including sandwiches, smoothies and more. 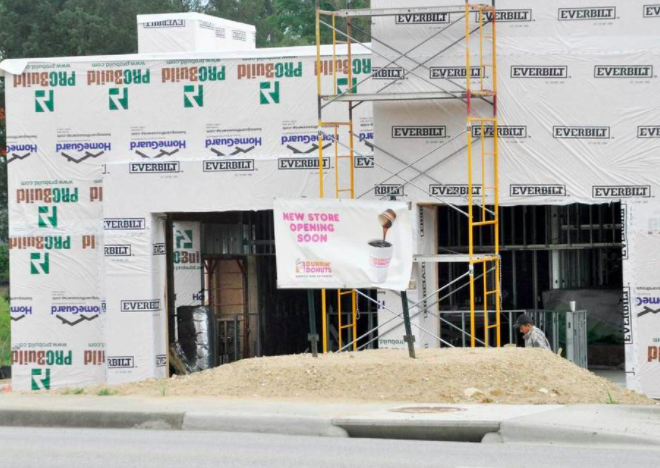 In addition to Dunkin’ Donuts, Lake Wylie is also getting a new Taco Bell in the same location, ready to satisfy your craving for Mexican-Style fast food. With plans to hire about 40 new employees and to open on Memorial Day weekend, the store will be the latest prototype for the franchise, opening for breakfast at 7 a.m. and closing at midnight or even later. The Collett development still has space for two more businesses to open in the center.